My apologies if you've landed on this page via a Google search for 'land Rover engine service instructions', or something similar. This isn't a 'how-to', just an observational piece. When I first got my 110, as with any car I've bought, I decided to give it a quick service. I knew nothing about Land Rovers, but figured that a basic engine service wouldn't take much. Brake fluid looked clean, radiator fluid was fine, so a basic oil, oil filter, fuel filter and air filter change was all she was going to get for now. The next time I serviced the engine, I went to a local motor factor and got them even cheaper. Bargain! The most expensive thing was the air filter (well, apart from the oil), which looks like a jet turbine from a Boeing! If you were ever put off buying a Land Rover because you thought they'd cost a lot to service, don't be. They do need a fair amount of fluid, but practically all of the work can be on a driveway by someone with basic knowledge and access to YouTube! Changing the oil is a doddle. 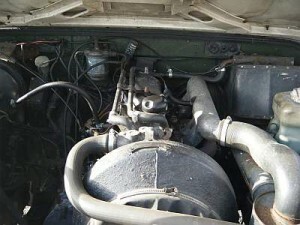 You can virtually stand up underneath a 110 Land Rover and everything under the bonnet is easily accessible, too. The only bit that required a bit of effort was the fuel filter, which needed priming. Very simple to do and almost primitive with it. It was obvious to me that these vehicles were designed to run, not spend their lives in garages. There is more to servicing a Land Rover properly, as I would find out later, but it was pleasing to me to know that the engine, at least, was given a spring clean. Belts were checked, she was fired up again and I was back on the road in no time. I've no idea what the proper service intervals are for a Land Rover and, to be honest, I'm not that fussed. I have a few cars and change the oil and filters every year, as a matter of course. Murpha only did about 3000 miles, maximum, between oil changes. For a few quid, I think it's worth letting your car have that little bit of luxury.